This shirt is an ABSOLUTE RIOT. 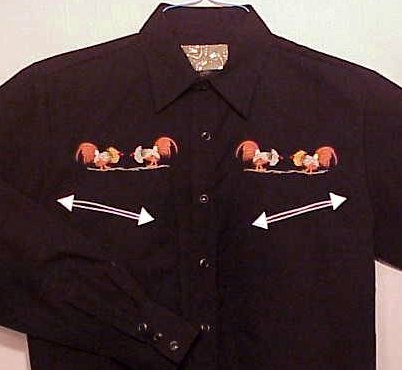 Who ever thought of putting ROOSTERS on a western shirt is a genius! In person the roosters really do look great and people are sure to flock about you all night just to get a look; talk about a CHICK MAGNET. This has to be one of the most UNIQUE while being TASTEFUL men's western shirts that I have ever seen. Naturally your favorite Clothing Diva kept one....Like the rest of these shirts, this shirt feels like a somewhat heavy sturdy cotton, yet it is a poly cotton blend. It has a very nice weight and feel to it; it is definitely made of a quality fabric that won't disappoint. This FANTASTIC GEM is capable of being machine washed (inside out), hand washed or of course, dry cleaned. Size and satisfaction are guaranteed or returnable as long as not "worn" or washed with buyer paying all shipping costs. Sizes: Sold Out $00.00 S&H $5.89 May still be SOLD OUT email before ordering.